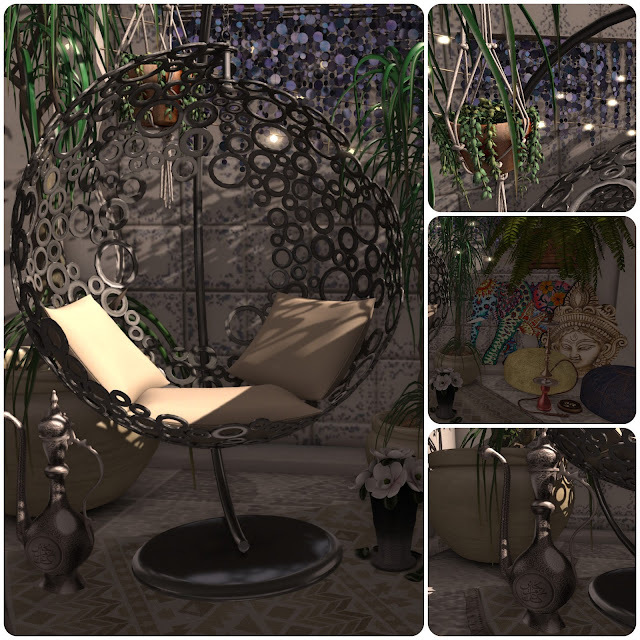 You still have time to run over to Shiny Shabby before it closes the next round. It'll be open until the 15th. At the event are these awesome new shoes from Essenz called Rosario. They're just gorgeous, right? They come in tons of different single colours and Essenz's also has fatpacks available. These shoes need either Maitreya or Slink high feet. Also be aware that Essenz's main store has moved. Here is the new landmark to the New Essenz's location. I am wearing a cute little lingerie set by Dead Dollz available at Crossroads. This top and bottom come in six different colours. The chair I'm sitting in is the newest release from Purple Poses + Me. It's a great photo prop and has tons of different poses build into the chair.